Although Carl Eugen Maria Hubert Appollinaris Weber was born in Cologne, Germany on October 19th 1820 in a catholic middle class family. His father was a clerk at the court of justice. In secondary school (1832-1838) Weber was a classmate of Vincenz Statz, who later became one of the leading neo-Gothic architects of the German speaking part of Europe. 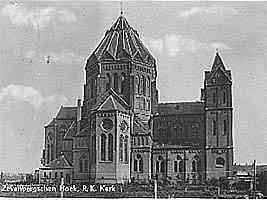 Growing up in Cologne, Weber witnessed the restoration and part of the completion of the Gothic cathedral, while also becoming acquainted with the various Romanesque churches in the city such as his own parish church, the late-Romanesque St. Gereon. It is unknown where Weber learned his architectural skills; his name is not mentioned in the lists of workers at the cathedral. Possibly he was educated at the office of another architect, possibly after becoming a carpenter first. By 1845 he had become an architect. Nothing is known about his early career until 1850. In his hometown Cologne he left few traces; probably he designed a (no longer existing) chapel for an Alexian monastery in his hometown, built in 1852-1853, which was designed by a Weber and which happened to be at just a few meters from Carl's house. Possibly the dominant position of Statz, who was advisor to the archbishop of Cologne and due to his contacts was often commisioned for new churches, urged Weber to look to the Netherlands for work, although until 1858 he remained a resident of Cologne, at least officially. 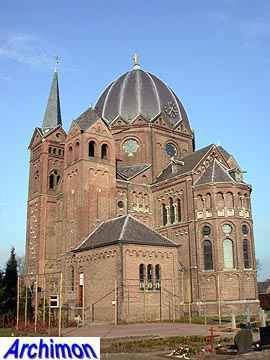 His career in the Netherlands started with the designing of several churches in the province of Limburg. In 1849 Weber had married Emily Stratford, a woman of English noble descent, which opened doors to nobility in Limburg and the German Rhineland. Emily died already in 1850, and in 1857 Weber married his second wife Maria Schiffer. A year later he settled in Roermond permanently. Confusingly, he changed his first name a few times since. Until c. 1860 he called himself both Karl and Carl. Once integrated into Roermonds French-oriented society he started calling himself Charles. Later he used the Dutch equivalent Karel until his death. All these names have been used in the scarce literature that has been published about him. Weber's career can be divided in three periods. In the first period (until ca. 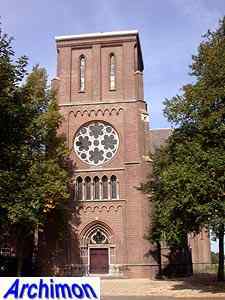 1870) he mostly designed churches in the early, decorative neo-Gothic style and was inspired mainly by late Rhineland Gothic. Many churches of this period are of the Stufenhalle-type, a type of hall-church typical for Westphalia, with three aisles under one roof and the side-aisles being narrower than the central aisle. He continued to use early neo-Gothic ornamenture and plaster vaults especially in his interiors for a long time. In this period Weber competed with P.J.H. 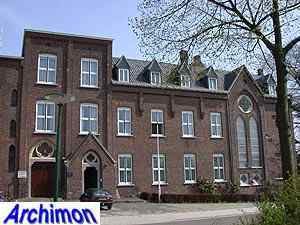 Cuypers over the assignments in the Roermond diocese (the province of Limburg) and usually lost. The rivalry between the two architects reached a height when Weber criticized P.J.H. Cuypers' plans, published in 1863, for the replacement of the historic eastern towers and the addition of new western towers to the late Romanesque Munsterkerk of Roermond. In the second period, after ca. 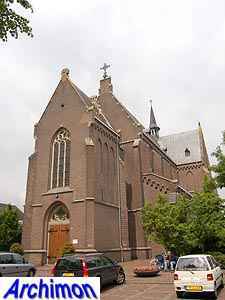 1870, early neo-Gothic was replaced by a more rationalist form of neo-Gothic, following the national tendency lead by Cuypers and A. Tepe for churches with a truly Gothic construction. Like Tepe, Weber drew inspiration from indigenous Gothic styles, especially Lower Rhine Gothic as endorsed by the powerful St. Bernulphus Guild. In this period Weber began to vault his churches in brick instead of plaster. In the third and final period in Weber's career, beginning in ca. 1880, influences from Romanesque architecture became more dominant. 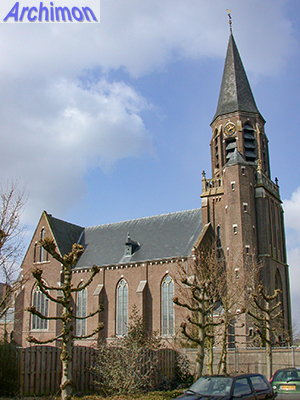 Weber's most monumental works are from this period, when the Munsterkerk, ironically including Cuypers' changes, became a major influence on Weber's churches. A series of big and expensive churches in neo-Romanogothic style was built, notable for the presence of a tall polygonal dome at the crossing. 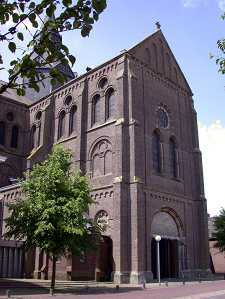 As a cheaper alternative, Weber also designed several neo-Gothic churches, but often with details, or a ground plan, reminding of the Munsterkerk. 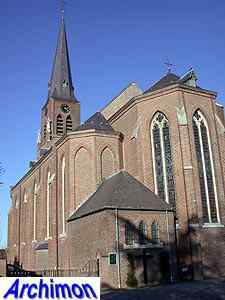 Weber built at least 33 churches, mostly in the Roermond and 's-Hertogenbosch dioceses. He was also responsible for the restoration of many older churches. He retired in ca. 1895. The last years of his life he suffered from a disease to the eyes, which made it impossible for him to work. 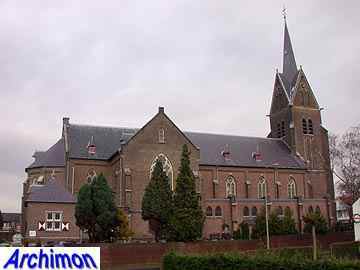 He died in Roermond on March 21 1908. The following is a list of Weber's work, with emphasis on churches. It is probably incomplete. Probably by Weber. The enlargement of an existing church resulted in a neo-Gothic building of the Stufenhalle type. Demolished. Weber's first church is a neo-Gothic church with two towers and fake plaster vaults. The church follows the model of the Stufenhalle. Probably by Weber. No further details. Weber's second church is finished in a much more simplified version than the architect intended. Responsible for this is building contractor Kemps, who offers to build the church for a ridiculously low price. The church again is of the Stufenhalle type. The tower consist of two parts on a square base, with an octagonal part on top. Demolished in 1963. Weber takes over after a first design by P.J.H. Cuypers is disapproved. Small hall-church. Tower built in 1874. Demolished in 1930. 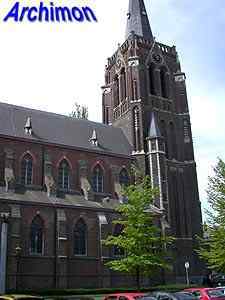 Three-aisled neo-Gothic church with tower in decorative neo-Gothic style. Demolished and replaced by a J. Stuyt design in 1932, in which Weber's tower was incorporated, albeit altered beyond recognition. Three-aisled cruciform hall church, inspired by classic French Gothic. Choir with side-chapels and three triangular radiating chapels with gables. Narrow tower with octagonal upper segment. Demolished ca. 1965. Cruciform basilica in a largely Neo-Romanesque style, incorporating a Romanesque tower. Church demolished in 1941. Neo-Gothic church of the Stufenhalle type. Plastered wooden vaults and western tower with diagonally positioned buttresses reaching almost to the top. Construction of the tower postponed until 1872 because of financial problems. Building completed ca. 1879. 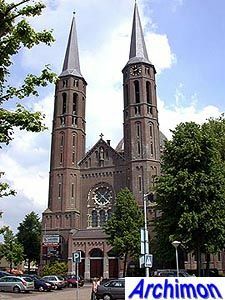 Highest located church in the Netherlands. Three-aisled neo-Gothic hall-church of the Stufenhalle-type with narrower and lower choir with lateral apses. Tower by C. Franssen added in 1896. 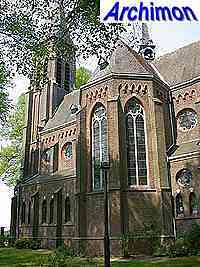 Church of the Stufenhalle type, similar to the one in Vijlen but more sober. Tower is crowned with a short spire, which is replaced by a taller one in 1907. Church demolished in 1937. Neo-Gothic church in classic French style. The design incorporates an older tower. 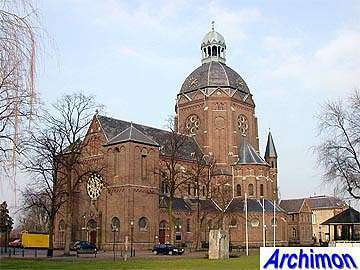 In 1957 the building was extended with a transept and a baptistry by an architect Palmen. Three-aisled cruciform basilica in neo-Gothic style. Choir with lateral chapels. In the original design a tower was part of the plan, but it was not build. 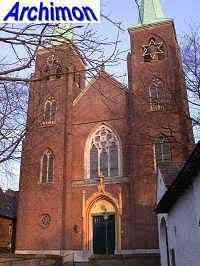 In 1892-1893 the church was enlarged by Jos. 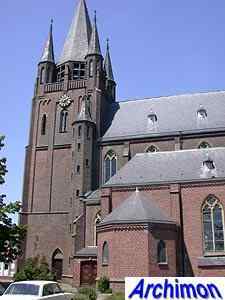 Cuypers, who extended the nave and added a tall crossing-tower. 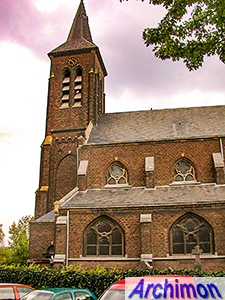 Damaged in 1944 and partly rebuilt in 1945; in 1957 the church was eventually demolished. Originally a simple hall-church. At first an old tower is incorporated, which in 1867 is replaced by a new one. 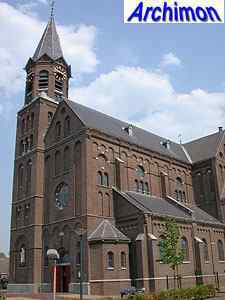 In 1913 the church is enlarged by Belgian architect A. Faurel, who adds a transept, a choir and side-aisles. Three-aisled neo-Gothic cruciform basilican church in classic French style, with high clerestorey and plastered wooden vaults. Square tower with octagonal upper segment with pinacles at the corners and crowned with a spire. Demolished in 1960. A first design for a large cruciform church without tower was not accepted. Instead a more modest neo-Gothic church with tower was built. In 1927 Jos. 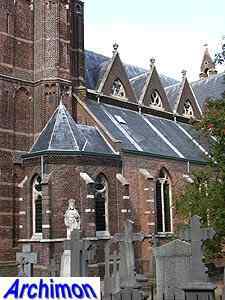 Cuypers added a transept and a choir to the church. In 1956 two side-aisles were added. 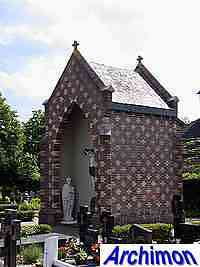 Neo-Gothic chapel-like tomb, built of marl. Weber's first church with stone vaults. Tower built in 1873. Destroyed by fire in the 1960's. Small hall-church with medieval tower which was restored by Weber in 1885. Destroyed or demolished? 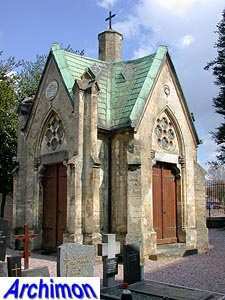 Small building in neo-Gothic style at a cemetary. Pseudo-basilical hall-church with pseudo-transepts in neo-Gothic style and a tower with an octagonal upper segment. Weber's first church with brick vaults. Cruciform basilican church with three-sided choir and transept-arms. Plastered wooden vaults. Tower with an octagonal upper segment. Combination of neo-Gothic and neo-Romanesque styles. Some alterations in 1879. Three-aisled neo-Gothic cruciform basilica. 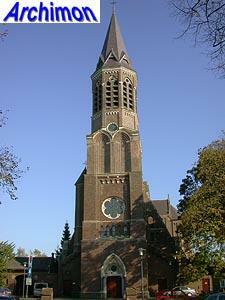 Spire added in 1906 by J. Stuyt. Three-aisled cruciform church. Destroyed in 1944. Changes include the heightening of the side-walls and the enlargement of the roof until it covered the side-aisles. Three-aisled cruciform basilica in in neo-Gothic style with tall frontal tower and polygonally closed transept-arms. Destroyed in 1944. Church and tower restored by Weber in 1880, but largely replaced by a H.W. Valk-design in 1930-1931. This cruciform church replaced a chapel from 1437 on the location were St. Odulphus supposedly was born in 775. The richly decorated church's tower is inspired by the Campine Gothic style. The original spire was lost in 1944 and replaced by a new one in 1959. The church itself is more modestly decorated. Inside, on a pillar in one of the chapels, a sculpture of Weber's head can be found. Weber provided the plans for this church free of charge. 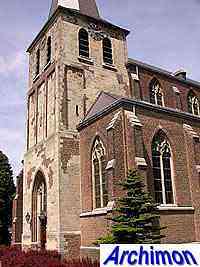 Church incorporates a tower from 1775. The old nave is turned into 10 pillars. The side-walls are heightened to turn the old nave into a high central aisle with 10 windows. Vaults are made of wood and reed. Two new side-aisles are added. Choir and transept are also new. This church is severely damaged in World War Two and not repaired. Three-aisled cruciform church in neo-Gothic style. Polygonal transept-arms. Three-aisled cruciform basilica in neo-Romanogothic style, with an octagonal crossing-tower. Cloverleaf-shaped eastern part. Choir and transept-arms have apses with ambulatories, the transepts are flanked by stair-turrets. This church marks the transition between Weber's early neo-Gothic period, and his later neo-Romanogothic period. The crossing-tower was intended to be build in brick but was constructed out of wood and lead instead. The construction of this church was hindered by many problems. The biggest disaster happened on December the 5th, 1882, when the northern transept collapsed, killing ten workers. Cruciform basilican church with tall octagonal tower with polygonal dome. Details in Gothic style. Square towers on both sides of the facade. Choir and transepts with three-sided apses. 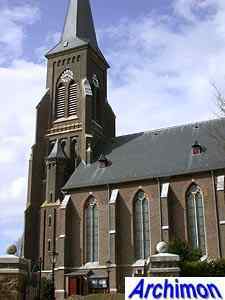 The church was actually too large for this small village, but being located close to the border with Zuid-Holland, near the railroad crossing the border between catholic Brabant and protestant Holland, it had great symbolic value by showing the protestants 'in their face' that despite centuries of oppression, the catholics were still there. Badly damaged in WW2, and replaced by a new church later. Three-aisled cruciform basilica in neo-Gothic style. Transept lightly extends the width of the nave. The tower , which is narrower than the nave, was added in 1891 and was built at some distance from the nave, with which it is connected by a narrow trave. After being damaged in the World War Two it was rebuilt to a lower height in 1949. Three-aisled cruciform basilican church in neo-Romanogothic style with an octagonal crossing-tower with dome and octagonal western towers. Apses at the choir and transept-arms; only the apse of the choir has an ambulatory. Interior mostly executed in red brick. Cruciform basilican church in neo-Romanogothic style with cloverleaf-shaped eastern part, with apses with ambulatories at the choir and the transept-arms. Although the western towers were never finished, this church is often referred to as Weber's finest work. Large three-aisled cruciform basilican church in neo-Romanogothic style with a cloverleaf-shaped eastern part with an octagonal dome on the crossing. The two towers at the front were not added until 1895 and ironically were inspired by those Weber's rival P.J.H. 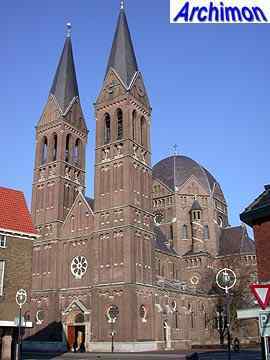 Cuypers had designed for the Munsterkerk in Roermond. In the interior brick in several different colours were used. Weber's last dome-church is also the smallest. Here the architect paid more attention than usual to the decorative detailing of the actual building, and less to the dome. Originally the eastern towers were much taller and had an octagonal upper segment. After having been damaged in World War Two these were not restored, but rebuilt differently and to a lower height. Basilical cruciform church in mostly neo-Gothic style, with some details in Webers neo-Romanogothic style. Polygonal transept-arms. Tower is unfinished. Transforming a pseudo-basilica into a basilica; three new dormers on each side of the roof are added to function as a clerestorey. Three-aisled cruciform basilica in neo-Romanogothic style. Square tower at the western trave of the northern side-aisle, with octagonal upper segment. Internally, this is a dome church, as the crossing is covered by a dome which however externally is hidden underneath the roof. Weber's last design. Octagonal spire on a square base, with small towers on each corner. Destroyed during a storm in 1921.